Tobacco use is the leading cause of preventable death in the world. Globally, smoking kills more people every year than HIV, tuberculosis and malaria combined. By 2030, more than 80% of the world's tobacco-related deaths will occur in low and middle income countries (LMICs). Preventing people from starting to use tobacco, and encouraging users to stop, is a global priority. The programme will be undertaken in two parts of the world (South Asia and Sub-Saharan Africa) where progress on tobacco control has not always been good, and where the tobacco industry is active in attempting to undermine measures that work. The grant will build research capacity in several LMICs, through funding for in-country senior researchers and post-doctoral scholars who will undertake research designed to address local priorities in each country, supported by a programme of training in research methods and public and policy engagement. The overall aim of the programme is to improve research capacity in Low and Middle Income Countries (LMICs) to conduct high quality studies that will generate evidence on how to reduce morbidity and mortality caused by tobacco use and to advance key development priorities. 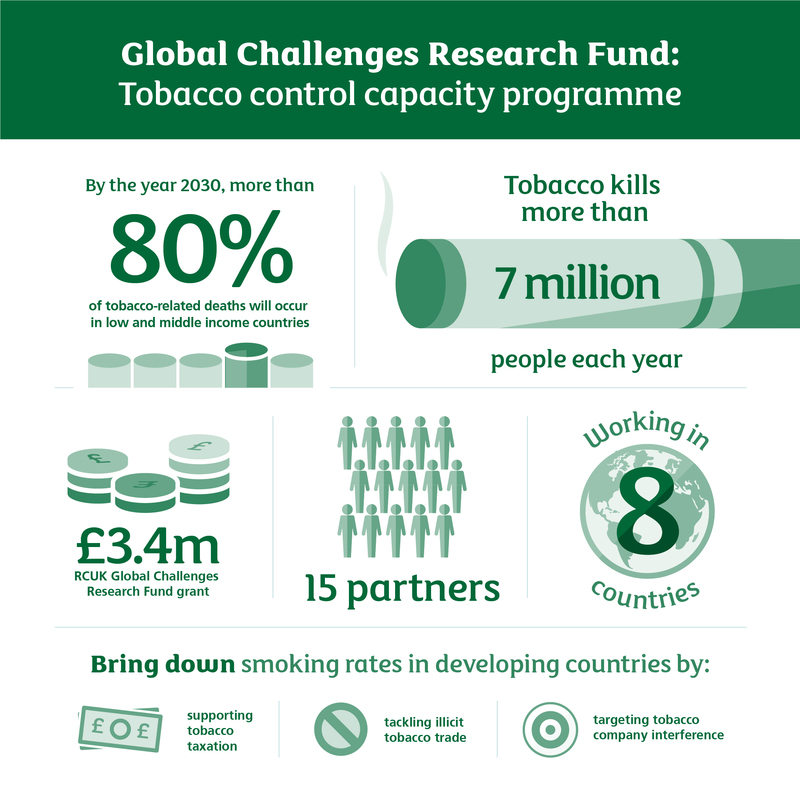 Develop a consortium of partners led by the UK Centre for Tobacco and Alcohol Studies, a UKCRC Centre of Excellence. UKCTAS will collaborate with Research Organisations in LMICs in South Asia and Sub-Saharan Africa, along with Cancer Research UK's International Tobacco Control Programme. 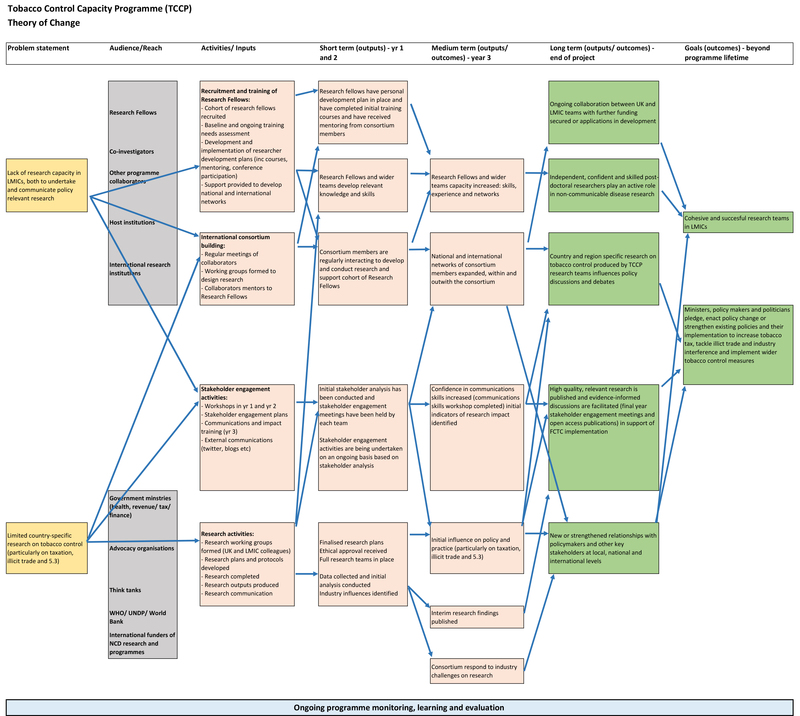 The team will be supported by a range of organisations and funders (Linkages and collaboration). A comprehensive description and illustration of how and why desired change is expected to happen thoughout this project. Click here to view on desktop.